Love this one! An all-time FAVORITE. When I noticed the large quantities of dried oregano and pepper, I was concerned but I had already bought the ingredients and planned to take this to a potluck. I decided to trust the recipe rather than my instincts. 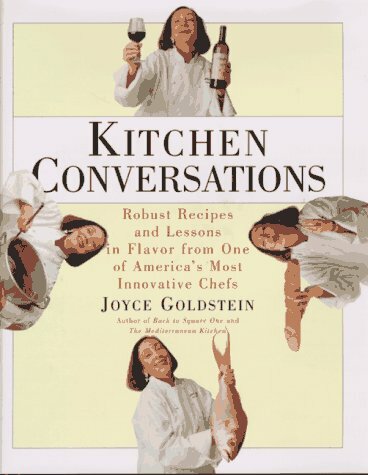 After all, it's a Joyce Goldstein cookbook. Who am I to question? She, of course, was right. The large quantities of pepper and dried oregano were the right amount for the dish. Although it turned out very well, I think I'll keep looking for a truly amazing potluck salad. This is a delicious cake. It's a project to make but there are many servings, and it's good for breakfast, too. I have never substituted apricot jam. The quince is too delicious for that kind of risk taking! The author of The Mediterranean Kitchen shares some of her secrets, as well as 160 innovative recipes for such delicacies as roast duck with caramelized turnips and parsley and escarole salad.